Click here to preorder Yuna for $40 per doll. We Like to Dream BIG! 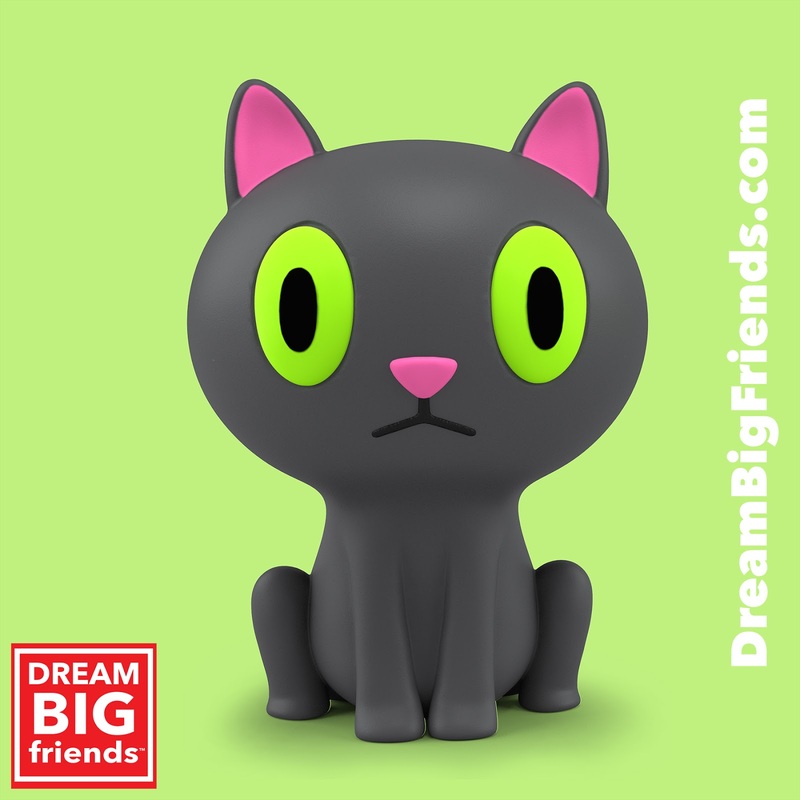 Dream Big Friends is a project imagined by two friends working in the toy industry, who both oversee the creation of countless toys and collectibles of every shape and size for some of the biggest brands around. It wasn't until they became parents, able to watch their own children as they play, learn and grow, that they came to realize there may be a better imaginative play experience for children. One that does not focus on blue or pink, super model or super hero, but instead focuses on dreaming big, doing what you love, and aspiring to be happy. The goal was to create a series of 10-inch-tall, articulated dolls based on characters that are as smart, funny, inquisitive and rambunctious as the kids we all know in our daily lives, and develop a story where these individuals live and grow. Out of that dream, Yuna and the Dream Big Friends were born as companions for kids all over the world. Instead of focusing on fashion or action, we focused on aspiration, fun, and producing a creative play experience through exploration of the world around us. We set out to make something that we would feel genuinely GOOD about presenting to the entire planet, as well as to our own children. We did not wish to cover our dolls in makeup or introduce them in the latest high fashion trends. We wanted to allow each character's unique qualities to shine through, packed with the basic things they would have on an average day when extraordinary things can happen. Our doll's primary accessory is possibility! We've brought our project to Kickstarter in hopes of giving it the best chance at becoming a reality. More importantly, we are working through Kickstarter in the hope of finding an early audience who believe in what we are trying to achieve, and who understand the alternate choices we want to bring to kids around the world. We've done all of the design, set up, preparation and hard work... now we need your help so that we can fully fund the tooling and production costs ... but most of all we need your help sharing this project with your friends! We wanted our first doll, and all of her friends, to feel like very real characters filled with rich stories and personality - vessels for your imagination. We think that her design is simply beautiful, just like we believe every person is beautiful regardless of height, color or body type. We are all beautiful in our own way, and we can be anything we can imagine. Our wish is that Yuna and her Dream Big Friends will encourage all kids to embrace what makes them who and what they are, inside and out. BIG DREAM: To one day establish her own commercial rocket company. She believes she is destined to go to Mars. BIG LOVE: Rockets, photography, painting and drawing. BIG MOVES: This summer her art will be featured in a group show at the Giant Robot gallery. BEST FRIENDS: Jenica, Pepper, Traci, Sofia and her cat Kamata. LIKES: Space, rockets, art, painting, die cast metal toys from Japan, digital cameras from Akihabara. Hanging out at Giant Robot on Sawtelle Blvd. 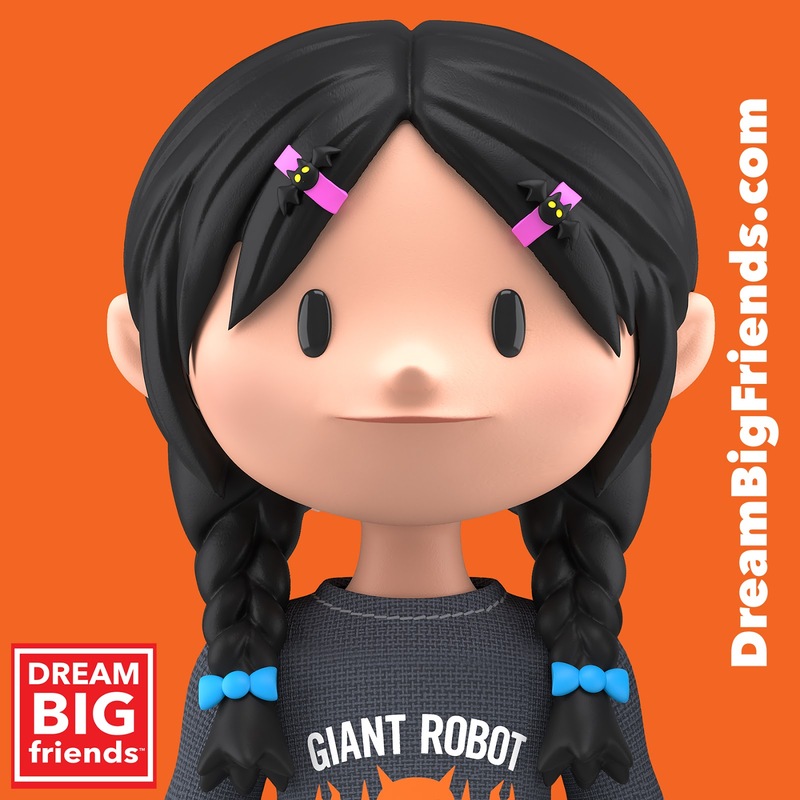 The Kickstarter to fund the production of Yuna, the first character in our expansive Dream Big Friends line of positive, encouraging dolls, is well on its way! Click here to back the Kickstarter - you can order the 10", fully articulated Yuna plus her kitty Kamata for just $40 + shipping! We just got back from DCon where we revealed the Yuna prototypes to the public for the first time. It was a ton of fun and we had 100% super positive feedback - people LOVE her! 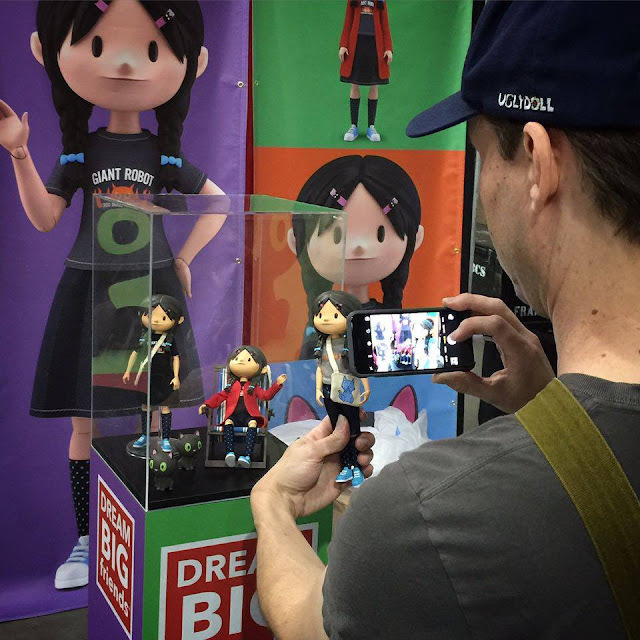 Below is David Horvath, co-creator, snapping a pic of the prototypes. 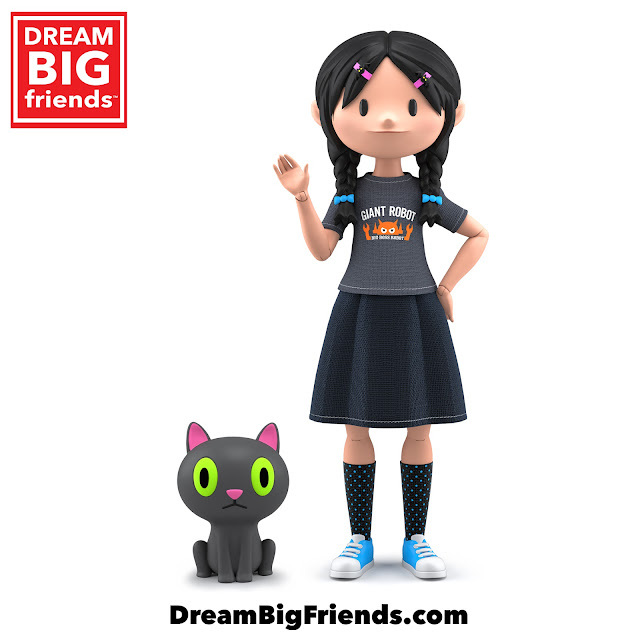 Dream Big Friends is a doll line concept developed by David Horvath and Sun Min (Uglydoll creators) and Klim Kozinevich (Bigshot Toyworks creative lead) that fills a gap in the market for dolls which are fully encouraging of imagination, with positive messages and cute, approachable design. For instance: Yuna loves science and rockets. She wants to own her own rocket company and fly to Mars, where she will be the first person to walk on the Red Planet! She loves K-pop music and hanging out at Giant Robot (dig the shirt!). She has a cat named Kamata and likes wearing funky socks, and her big red coat is her favorite piece of clothing. The idea is to make Yuna, and all of the Dream Big Friends characters, as real as possible, with unique and distinct qualities that makes them all special. By showing how different and special each character is, Dream Big Friends hopes to encourage both girls and boys to celebrate that which makes each of them special. David, Sun Min and Klim have big plans to release more characters of all different backgrounds, ethnicities and yes, boy characters in addition to the girls. The first step is getting the Yuna Kickstarter funded, and everything will take off from there. Yuna measures 10" tall and she is a fully articulated doll with real clothing. 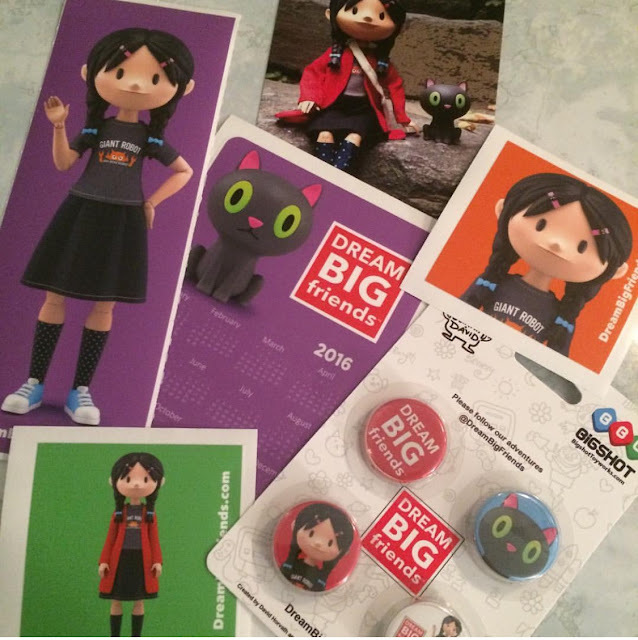 Dream Big Friends dolls will be safety tested for kids, and the scheduled ship date is Q2/Q3 2016.